I had originally planned on a demo release today but it looks like I need at least another couple of weeks to complete it. I’m doing some additional AI work on the enemy vessels and implementing features that will help make the game more moddable in the future. 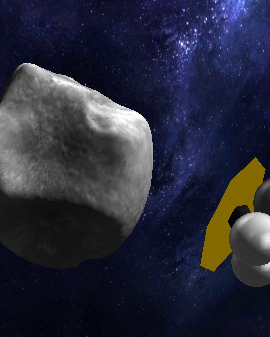 I also went ahead and upgraded to Unity Pro so I’m incorporating some higher resolution textures as well. I’ve reached agreement with FastSpring to handle setting up the pre-order/donate tiers to match the Kickstarter pledge levels – but will wait to turn those on until the demo is released. At this point I’m planning on a release for July 27th. I will notify everyone via the site and Kickstarter when the release goes out. The forum is available if you have any questions or comments. Created a forum for TorchShips – I’m using a hosted solution from Vanilla forums – which so far I like a lot. You can reach the forum from the ‘Forum’ link in the menu on our home page or go straight there. Please sign up and post any thoughts or questions you have – together I believe we can create a wonderful game – thanks. Below is ‘plan B’ – with estimated dates for completion. Thank you again for all your support and I’ll continue to post updates here and at TorchShips.com. I answered some questions from Brian Rubin about TorchShips at Space Game Junkie. Combat in TorchShips will feel a lot different than the usual space combat simulation.There will be very few ‘turn and burn’ furballs during combat and most engagements will take place at very long ranges. Two factors in the TorchShip universe definitely affect tactics. Combat is rarely to the death, especially early in the game, your goals are to drive off or cripple opposing ships, not destroy them. Secondly – AI and combat software is not very capable (in fact due to Earth’s Silence and subsequent AI backlash most human governments and religions ban even sub-sentient AIs and any type of sophisticated software). There are no autonomous drones that can fight without guidance – all combat takes place between human crewed spacecraft. 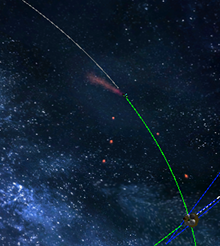 Combat is almost always triggered by Faster-Than-Light entry into a masspoint – a planet, a comet, or a group of asteroids. 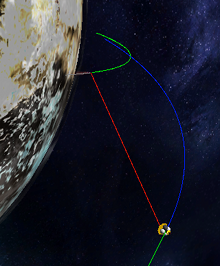 Your ship will enter realspace with a small residual velocity (about 5 km/sec) and positioned at the FTL mass limit of the body (about 3,000 km for a earth sized mass). 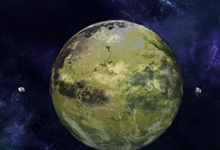 At long ranges you will maneuver to stay ‘up-orbit’ of your target (so that you’re firing down the gravity well and getting the small benefit of the planet’s gravity) and using local terrain and neutral shipping and stations to mask your ship if that is possible. If your opponent’s path is predictable you can attempt to seed the space ahead of them with time delayed missiles or kinetic rounds. You can snipe with long range laser cannon fire, you have an unlimited number of shots, but the cannon does use energy and generates a lot of waste heat that will have to be dealt with. When not maneuvering keep your fore or aft shield orientated toward any hostile ship firing beam weapons at you. If you take damage rotate your ship to minimize burn through. As you enter missile range you have multiple options – you can fire at extreme range – or close and attempt to overwhelm your target’s point defense. 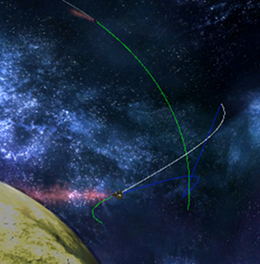 Missiles can be timed to launch in a cluster, or used like mines and timed to drift in to the path of your target if positioned correctly. You can run out of missiles, but they have very low heat and energy costs to fire. 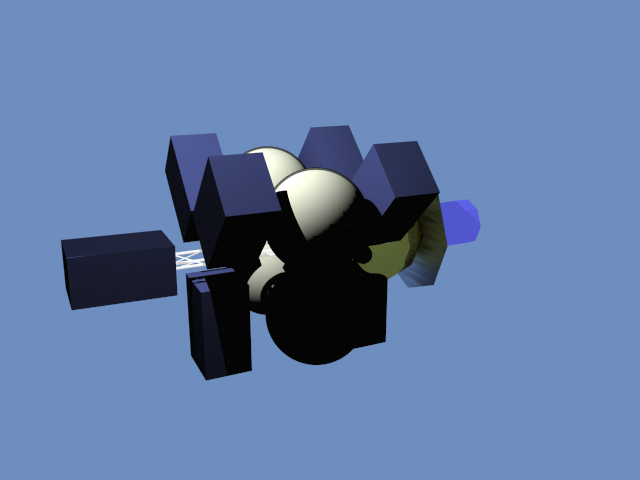 Though rare – combat at shorter ranges can use the railgun (kinetic lance) to hammer your opponent. Even your reaction drive can be used as a weapon at extremely close ranges (<20 km). If you are in combat around a neutral planet or defending your own system you must be very careful of the long term vectors of any ordinance you fire. It is all well and good to fire dozens of missiles and hundreds of kinetic rounds at a your target, but some will miss and some of those if not aimed and launched carefully could impact the planet or neutral/civilian shipping and stations and cause horrific damage and casualties. We just launched our Kickstarter project. Please take a look and if you like what you see please sign up as a backer and tell your friends.